Cathedral Snow by Stephen Lyman. 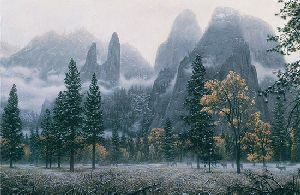 In "Cathedral Snow" the beautiful ethereal autumn scene is set in Yosemite Valley. The first snow of the season is lying lightly on the dying meadow grass and will melt as soon as the sun comes up. The name of the image not only refers to the areas of Yosemite called Cathedral Rocks and Cathedral Spires but evokes a spiritual and sacred mood. The clouds and light glowing from above heighten the sacred feeling. The deer depicted are a common sight in the valley. They help show the size and scale of the rocks and cliffs in the distance. The cliffs are about 2,000 feet high.